Lady Ying was born in 1936. She is 82 years old now and lives in Hong Kong. She is very happy, healthy and looks much younger than her actual age. Even young people would like to do the splits as easily as she can. Everyone calls her Sister Ying (英姐). But she was totally another person 18 years ago. She was severely overweight, had high blood pressure and diabetes for years. She also had severe arthritis that she could barely move her body. It would kill her if she walked for just a few minutes. Life only meant suffering to her. At that time, she was only 64 years old. In 2000, one of her friends introduced her to Zhineng Qigong science. 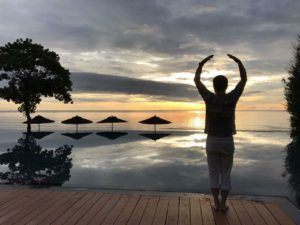 She decided to give it a try and attended her first Qigong healing retreat in ShenZhen (深圳). Just like herself, most of the students who came to the retreat had at least one physical or mental condition. They had been taking medicines for years. Some of them had survived from several hospital treatments, and yet were still suffering. Ying came to the class and found it had a wonderful and happy atmosphere. Teachers were so knowledgeable, skillful and friendly. She listened to teacher’s lectures about this qigong science. She followed the teachers to practice. There was that loving and harmonious Qi field in the class that also did the healing. Her pain was eased off. She found her body became more and more flexible. The smile was back to her face. Within a year after she finished that Qigong retreat, her condition was dramatically improved. She lost weight; her blood pressure and blood sugar were back to normal; her joint problem was gone. Ying enjoys her happy and healthy life without taking any medicines for many years now. She can enjoy her favorite dessert, ice cream, at any time without hesitation. And she still does 200 wall squats and “Lift qi up and pour qi down” level one form and “Bend over and arch back” level two form everyday. “Life would be miserable if not for Zhineng Qigong.” as she always told other people.